Villa with private pool and panoramic view to Pissouri village. Free Wi-Fi, Satellite TV with sport channels, free air-conditioning. A quiet location. 3 minutes drive to the beach. Pissouri village is 5 minutes drive from the villa with its own Amphitheatre and village square. Paphos and Limassol are about 30 minutes drive. Aphrodite’s rock is 10 minutes drive, and many more historical places within easy driving distance. Open plan lounge/dining room. TV (satellite), 2 settees and armchair, coffee table. Dining table and 6 chairs with patio doors leading to pool area. Wi-fi internet access available in villa. New Modern kitchen comprising of cooker with extractor fan, fridge/freezer, microwave and dish washer. Three golf courses, Aphrodite Hills, Secret Valley and Elias, 20 minutes by car. Notes on accommodation: Cot and high chair can be provided upon request Outside: Private garden, with large swimming pool, outside dining table with 6 chairs, 6 sun loungers. Barbecue, covered patio area, umbrellas. Utility Room: Washing machine and tumble drier. Cleaning / Towels / Linen / Maid service: All towels and linen are provided with the exception of beach towels. The villa will be cleaned before arrival, linen and towels will be changed weekly. 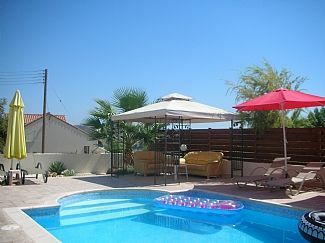 The blue flag beach is 5 minutes drive with restaurants, tavernas and shops. Further beaches within easy driving distance. Paphos airport is 20 to 25 minutes drive. Larnaca airport is 1½ hour drive. Car hire is recommended. Pissouri village is 5 minutes drive from the villa with its own Amphitheatre and village square. Paphos and Limassol are about 30 minutes drive. Aphrodite’s rock is 10 minutes drive, and many more historical places within easy driving distance. At Pissouri beach area there is one bank with 24 hour cash machine. Water sports. Dive center. Shops and supermarkets. Hotel spa and beauty treatment. Tavernas, one having a Cypriot night on a Friday, Pizza place, Indian restaurant, beach front taverna. Car hire. Booking Notes: A 20% deposit at time of booking with balance payable four weeks before arrival date. special offer. 20percent discount for all available dates Changeover Day: Changeover date flexible. Normal check out will be 12 noon, on day of departure. The villa may be available for late departures, depending on bookings.